One thing fans rarely get to do with their favorite movies is visit the actual sets. Mostly that’s because they were built in a far-off, secluded film studio and destroyed before the movie even came out. But the idea of making that experience possible for fans is one of the seeds that breathed life into Alita: Battle Angel - Passport to Iron City. Alita: Battle Angel - Passport to Iron City is a one-of-a-kind interactive experience that opens in Los Angeles January 23, New York on January 26, and Austin on January 29, ahead of the Robert Rodriguez-directed film itself opening February 14. Its aim is to give fans the opportunity to interact, play, and compete on a pseudo-film set that feels like you’re in the movie. io9 was lucky enough to get a preview of the event aand here’s what we found. From the moment you walk into the door, everyone involved wants you to believe you’re in Alita: Battle Angel and the year is 2563. The hallway is themed. The employees are in character. You get a high-tech ID badge, sign up for a team, then find yourself hanging out in a full, functioning bar called Kansas. It’s here where teams gather at elaborate touch screens and can prepare for what’s to come...or just drink a bunch of beer that was custom designed for the event. At this point, I’d recommend at least skimming the information on the touch screens because not only does it set the tone for what you’re about to do, it provides context for the world you’re about to enter, and offers information vital to your success inside. The level of detail at Passport to Iron City is excellent. I’ll now be explaining a little of what you’ll find inside Passport to Iron City so if you think you might make it to one of the experiences and don’t want to be spoiled, here’s the link for tickets and have a nice day. 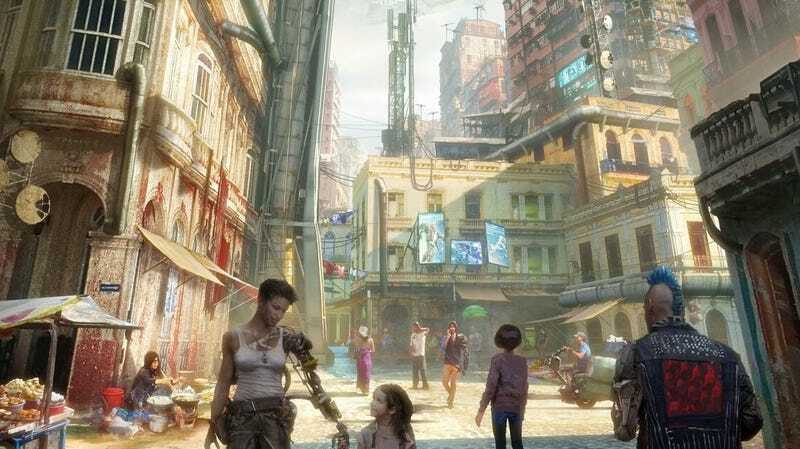 Once you exit the bar, you’ll find yourself in a beautifully detailed recreation of elements from Alita: Battle Angel, all working together to make it seem like you’re in some kind of marketplace in the year 2563. In fact, you already were in a recreated set, the aforementioned Kansas bar, which was carefully designed and constructed with help from the film’s production designers to mirror the bar in the movie. The Kansas bar looks just like it will in the movie. Inside, a robot representing The Factory, the group in charge, explains what’s about to happen. Each team is assigned to a specific station to begin the experience and then, over the course of the next 40 minutes, it’s a mad dash to accrue as many credits as possible, all of which is tallied in real time on a large leaderboard that you are encouraged to check regularly. Think of it like a choose your own adventure, escape room, boardgame with a team. Our first stop was Marketplace #1 where each team member was asked to smell a different scent and, if we could discern it, we would get credits. Later, we had to watch monitors to try and locate dangerous bounty hunters, kind of like a sophisticated version of Where’s Waldo. Another person asked trivia based on the information from the bar touch screens. All in all, there were at least 8 different stations, most of which my team was able to complete in the 40 minutes. As you and your team go from station to station, there are also optional side quests happening. A woman gives you a clipboard to solve riddles that are explained all over the walls across the experience. Another person explains if you can match the symbol on your badge to a person with the same symbol, you get points. All the while, the other teams are doing these things too and you can see how you are fairing at the live scoreboard, which is controlled in real time via your ID badge. Dr. Chiren’s Enhancement Assessment is one of the stations in the exhibit. Finally, as time ticks down you are encouraged to place a bet at the Motorball Stadium. This is a futuristic race that’s crucial to the film, and world, of Alita. Employees will offer hints as you and your team look at all the provided materials, including odds and updates on the conditions of the racers, helping you all make a good, educated bet. (Do it before the time runs out, though. We didn’t and it made the big finale less exciting.) Depending on if you bet correctly or not, your team can get a huge credit boost and maybe get to the top of the leader board. The team with the most credits at the end wins a prize (I didn’t win so I don’t know what that is) but really, win or lose, the whole experience is worth it. At the end of Passport to Iron City, my first thought was I wish I could do it again. Not just because we missed several stations and didn’t solve all the riddles, but because you are learning the games on the fly, with strangers, and by the end, it feels like you’re just getting started. If anything, you get so wrapped up in the game you never quite feel like you are in Alita: Battle Angel. That’s my only gripe. The game is so immersive and intense, you get lost and stop thinking about the content, you just think about the outcome. Alita: Battle Angel - Passport to Iron City opens in Los Angeles January 23, New York on January 26, and Austin on January 29. Tickets and information are available at this site.